Photo courtesy of Nico Meola. 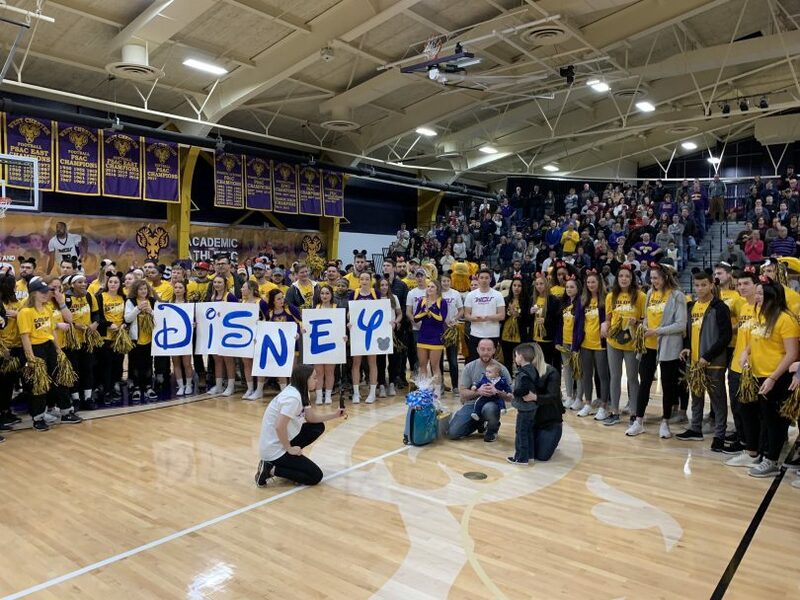 West Chester University’s Student Athletic Advisory Committee (SAAC) hosted their third consecutive Make-a-Wish reveal for 5-year-old Brody Spezio during the basketball games against Kutztown on Feb. 9. SAAC serves as a governing body for all student-athletes, and their primary initiative every academic year is to raise money for the Division II philanthropy, Make-a-Wish. Through countless fundraising efforts and Make-a-Wish events, West Chester has led the way for heartwarming reveals, sending three very deserving individuals to Hawaii, Kansas City and now Disney. Prior to the tip off of the men’s game, Brody and his parents took center court in front of over 1,200 fans, 200 students-athletes as well as an entire fan section dedicated to Brody. The Golden Ram family then took the court and the music began to play. The cheerleader’s signs revealed the letters D-I-S-N-E-Y. Then, the SAAC reps brought him his new luggage bag, Disney beach towels and much more— it was then when Brody realized that him and his family were going to Disney. Brody, our newest Golden Ram, is fighting a condition called pulmonary hypertension (PH). This is a condition where blood vessels carrying blood from the heart to the lungs become narrow, which makes it more difficult for the heart to do its job. It’s known as a rare, silent, chronic and incurable beast that typically gives the patient three to five years upon diagnosis. Brody suffers through his “PHighter” mentality everyday. Pulmonary hypertension induces fatigue, shortness of breath and many other physically limiting factors. Yet, none of these have stopped Brody. He continues to live his life full of love for dinosaurs and monster trucks. “When life-changing wishes are granted, a wish effect occurs. The wish allows children battling critical illnesses to build the hope and strength they need to fight harder and see the impossible become possible. Research shows wishes can give these children a higher chance of survival. It’s why health professionals often use a wish as part of their treatment plan, because wishes can build compliance with care and potentially give their patients a better chance of reducing time spent in the hospital. There is nothing more powerful than a child’s wish – that’s the wish effect,” Make-a-Wish said. The Golden Rams donated all funds raised during the basketball double-header towards research for pulmonary hypertension.